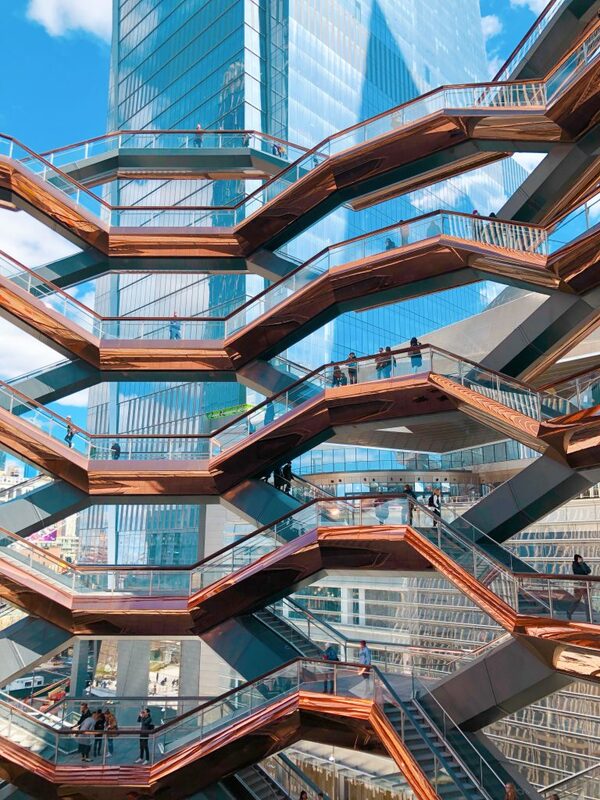 Part Eiffel Tower, part London Eye and part testament to the power of Instagram, Vessel is a striking, 16-storey honeycomb of staircases nestled amongst the jagged, gleaming towers of Manhattan’s newest neighbourhood, Hudson Yards — and in less than a month, it’s already catapulted to the top of the list of New York City must-sees (and must-photographs) alongside the Empire State Building and the Statue of Liberty. Built on top of active rail yards that still service Amtrak and New Jersey Transit, Hudson Yards is not your stereotypical New York neighbourhood of congested streets and soaring skyscrapers. Rather, it’s a glimpse at the architectural future of the city, or at least a developers’ idea of it. It’s engineered from studs to sky: Hudson Yards has generators that could power its buildings for up to three days in the case of a natural disaster, a water system that will filter and reuse 10 million gallons of stormwater collected each year from its rooftops and plazas, and trees that act as a natural cooling system to diffuse the heat rising from the train yard below. It has corporate offices and high-end residences, and a luxury hotel — the first wellness retreat created by Equinox — is under construction and slated to open this summer. The neighbourhood, which connects to nearby Chelsea and the Meatpacking District via the High Line, is anchored by remarkable public spaces, such as The Shed, a retractable concert hall and art space which opens April 5, and The Shops at Hudson Yards, a dazzling multi-level world of celebrity chef restaurants and tony boutiques. There will even be a school for local children. Of course, luxury comes at a price: one penthouse was listed for USD$32 million. I ventured down to New York for the grand opening of Hudson Yards on behalf of Canadian Geographic Travel. I walked some of Vessel’s 154 flights of stairs, taking in the breathtaking views from the top, and more than anything enjoying what has aptly been described as a jungle gym for adults. I checked out The Shed, stared up at Edge — not the Irish rock star but an observatory perched 101 floors up in one of Hudson Yard’s commercial office towers — and browsed through The Shops at Hudson Yards. Here are three reasons to add Hudson Yards to your next New York itinerary. Rising 16 storeys and weighing 600 tonnes, Vessel is a futuristic honeycomb structure and open-air monument created by British designer Thomas Heatherwick to serve as a walkable installation. Fabricated in Monfalcone, Italy, Vessel was shipped to Manhattan in pieces in six freighters. Each part was then ferried over from Newark, New Jersey, on a five-hour barge trip across the Hudson River. After months of careful construction, the attraction opened to the public on St. Patrick’s Day weekend and has already welcomed tens of thousands of visitors to climb its 2,500 steps and 80 landings, spread across more than a kilometre of copper- and stone-clad staircases. Every step higher brings an exhilarating rush, as the views (and selfie possibilities) expand. Next door, nestled at the base of a commercial tower, is The Shed, a cultural centre with a movable exterior wall that slides the structure in and out of the tower on a set of tracks. Icelandic singer Björk is scheduled to perform there later this year. In a city where space is at a premium, Manhattan is still managing to produce some of the world’s most luxurious shopping centres, first with Oculus at the base of the World Trade Centre, and now with The Shops at Hudson Yards. The retail centre offers seven levels of shopping and dining spread throughout a palatial concourse that opens up to the public square and gardens in an expansive Great Hall. The shopping centre is home to a number of Canadian brands like Lululemon, Rudsak and Aritzia plus a wide range of other designer shops, concept stores and fine dining establishments from some of New York’s brightest culinary minds. Stop for a taste tour of David Chang’s new Momofuku restaurant, Kāwi, before hitting the shops or climbing Vessel. Kāwi was inspired by Chef Eunjo Park’s fine-dining experience in Korea, and is one of 35 dining options throughout Hudson Yards. As if Vessel wasn’t enough of a conversation piece, Hudson Yards will debut a second attraction, Edge, early next year. 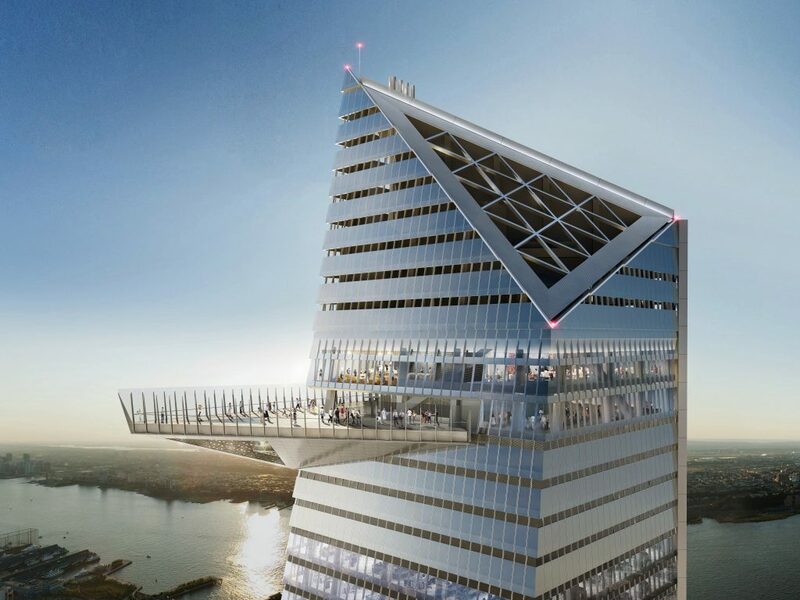 At 1,100 feet, Edge will become the tallest outdoor observation deck in the western hemisphere — and the second tallest indoor observation deck in New York City, following One World Observatory in Lower Manhattan. Travellers looking to test their tolerance for heights will be able to stroll on Edge’s glass floor. 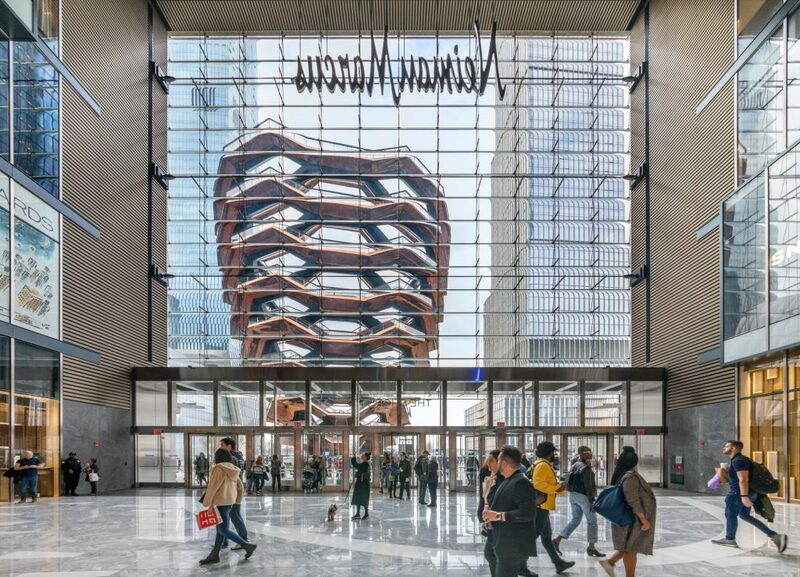 Editor’s Note: Vessel offers free admission using a timed ticketing system available online and in-person at the concierge station in The Shops at Hudson Yards.